I place myself wholeheartedly into my work through study, research, and focused attention. I study continually especially Raphael, the Italian Master, who is my biggest influence. I study my subject carefully too in order to understand why I’ve chosen it and what I need to say through it. Although I paint in both oil and watercolour, my first love is drawing. It is the foundation for all great art. The strength of my drawing speaks for itself – the drawing is the star. As an artist, drawing is my voice and my way of thinking. It expresses more than words and it is this sacred voice I protect and present in the most precious and gentle manner. For centuries scholars and patrons have been interpreting the work of artists; their aim to get into the artist’s mind to decipher her message. For my work, I want people to bring their own personal experiences to the artwork, to view it through their own lens and discover their own message. My work pulls people in close. It takes a moment for the work to reach the viewer but when it does, there is a calmness that comes over them or an emotional reaction that catches them off guard. This reaction is not for the subject matter alone since my subjects range from the complexity of the human form to the simplicity of a pebble – it is a response to the amazing Light that shines, that emanates from all things. Ellen Erenberg is a visual artist who still remembers being drawn into the visual appeal and unmistakable aroma of a new box of crayons. Eventually leaving the crayons behind, Ellen entered the University of Waterloo to pursue her Honours BA Fine Art major. Since education was always a priority in her life she continued on to Queen's University for an Honours B.Ed, 2 education specialists in Visual Arts and French as a Second Language and 8 years of study at the Academy of Realist Art, Toronto. It was at ARA that she was able to hone her drawing skills under the tutelage of Fernando Freitas and Ryan Gauvin with whom she continues to study. These two masters, along with inspiration from Raphael's line drawings, Pontormo's elegantly elongated figures, Alfons Mucha's ornate decorative style and Ozias Leduc's spirituality, encouraged Ellen to aim high resulting in drawings and paintings that express her sacred voice. 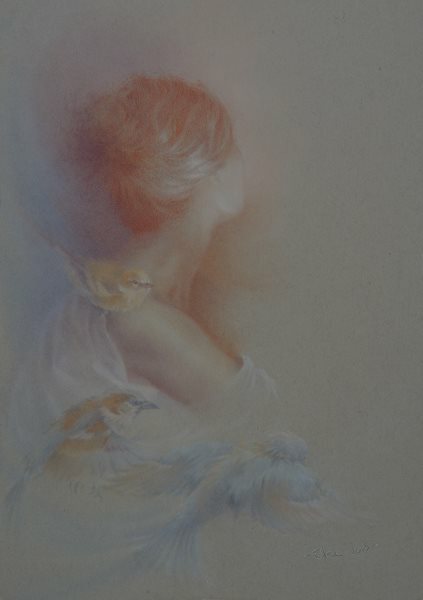 Red chalk, watercolour pencil and watercolour paint lend themselves well to Ellen's gentle approach to art. These media allow her to imbue her work with Light and Breath. Two blessings in particular, marriage and a pilgrimage to Italy, inspired a change in her career. Heading towards her principal's certification she did a complete turn-around, dropped the idea of pursuing a principalship and left public education altogether to enter her studio full time. Here, she was finally able to answer her call to art. This time to focus on art led to several group and solo exhibitions with the highlight being the unveiling of an 8' commissioned oil painting of Mary at the Foot of the Cross at Mary Immaculate Church, London, ON. Ellen continues to create art and teach from her studio and is currently working on a body of work to be exhibited October 2018. A box of crayons can still be found in her studio amongst her art supplies.